Zinedine Zidane steps down at Real Madrid after third Champions League title. 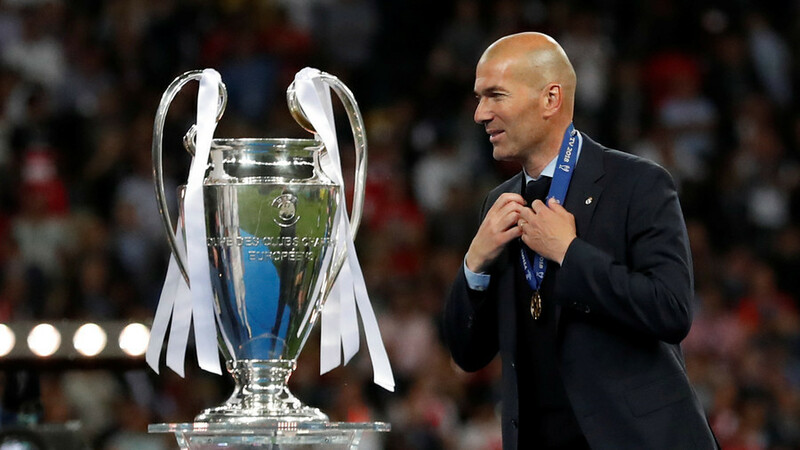 Zidane confirmed his departure at the start of the news briefing, just five days after he presided over the 3-1 Champions League final win over Liverpool . Even European success, which he also managed in each of his first two seasons in charge of the team, has not been enough to persuade him to prolong his spell. Madrid’s third-place La Liga finish is likely the major factor in Zidane’s departure, as Los Blancos ended the season 17 points adrift of bitter rivals and champions Barcelona. He did, however, confirm that he was not pushed out of the exit door. “It’s my decision,” he said. “For many people, this will not make sense, but it does for me. It’s time for a change. Zidane was appointed as Real Madrid boss in January 2016 and took charge of Madrid 149 times. He won 105 of those games, and as well as three Champions League titles, he also enjoyed success in La Liga in 2016-17.